Together with the Jeronimos Monastery, the Belem Tower is one of the most symbolic edifices of Lisbon. It too is an exquisite materialization of the superb Manuelin style (with discrete elements characteristic of sundry other architectural styles), and it too is part of the UNESCO World Heritage of the city (declared as such in 1983). 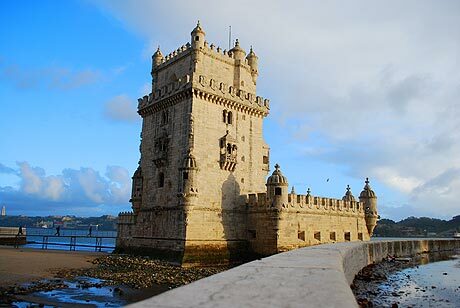 The tower is located, just as the name suggests, in the Belem district, and it is also known as the Tower or Castle of Saint Vincent (Castelo de Sao Vicente de Belem). The history of the tower is substantially related to the age of the great geographical discoveries. It was built in the 16th century (between 1514 and 1520), by order of King Manuel I, who decided to implement the plans of his predecessor, King Joao II, in order to reinforce the defense system on the shores of the Tagus River. The chief architect was Francisco de Arruda, who inserted visible Moorish elements in the overall structural and decorative patrimony of the tower. The tower is interesting to explore and admire both on the outside and on the inside. Thus, highlights refer to the Gothic statue of Nossa Senhora do Bom Sucesso (Our Lady of Good Fortune) placed under a lushly decorated canopy, to the rhinoceros head under the western watchtower of the structure, and, of course, to the totality of watchtowers, roofed balconies, windows, loggias and intricate decorative motifs which give the impression that, while carved in stone, are as light as to almost be able to float. The interior of the structure is divided into several levels. The first level is where the Governor’s Hall (Sala do Governador) is located, whereas the so-called Sala dos Reis (King’s Hall) is located on the second floor. The Audience Hall (Sala das Audiencias) is located on the third floor. The fourth floor is sunken in the richly decorated set yielded by the ceiling and by the walls. Lisbon Card holders can visit the Belem Tower for free, which is a pretty strong incentive, given the edifice is one of the most prized tourist sights of Lisbon.